The Sustainable Food Trade Association has partnered with the non-profit standards and certification organization B Lab to help organic companies quickly measure and assess the quality of their sustainability programs and their impacts on workers, local communities, and the environment. By filling out SFTA's organic industry-focused Quick Impact Assessment, organic companies can prove they can provide organic products and manage their operations in a sustainable manner – as well as learn where they can make improvements. The Sustainable Food Trade Association (SFTA) has partnered with the non-profit standards and certification organization B Lab to help organic companies quickly measure and assess the quality of their sustainability programs and their impacts on workers, local communities, and the environment. Measuring is key to successful sustainability programs which are fundamental to bringing about both cost savings and overall business success. 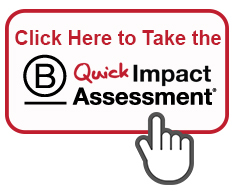 SFTA worked with B Lab to develop the free organic industry-focused Quick Impact Assessment (QIA). Its 30 questions address organic purchase/sales, community involvement, emissions, governance, humane animal management, stakeholder engagement, worker standards, and water quality/use. Instant results enable companies to compare themselves to other similar companies in the organic industry. Businesses can also ask their supply chains to complete the QIA to get the information they need to make their entire operations the most sustainable possible. SFTA will use the aggregate data to track the increase in sustainable practices among organic food companies in addition to the more extensive data its member companies already submit, and include the results in its Annual Member Sustainability Progress Report. If a business has already completed B Lab’s full impact assessment (a longer, more in-depth survey) or submitted a sustainability report to SFTA, that data can be integrated into this campaign. The Sustainable Food Trade Association’s (SFTA) mission is to build the capacity of the organic food trade to transition to sustainable business models. SFTA serves as a hub for businesses to learn, improve performance, communicate results, and share common metrics and best practices. B Lab is a 501(c)(3) nonprofit that serves a global movement of entrepreneurs using the power of business to solve social and environmental problems. B Lab’s mission is to redefine success in business so that one day all businesses compete to be best for the world and society enjoys a shared and durable prosperity.